The purpose of this award is to celebrate a project that shows promise of giving the world more productive, energy efficient and sustainable solutions. 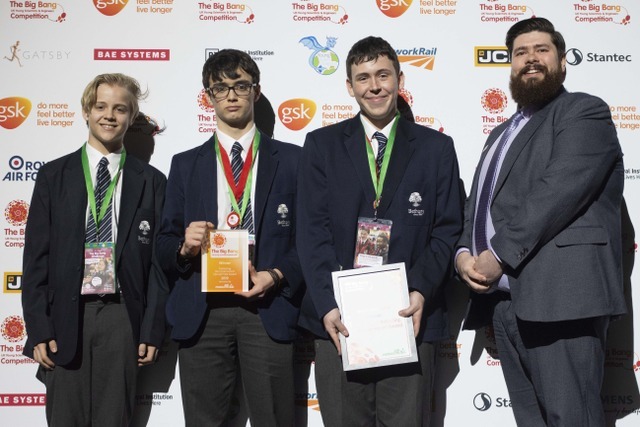 Max Brown, Alexander Clarke and William Stoneham – the creators of the ‘MAW Heating Solution’ – have worked hard on their winning project for months, since qualifying from the initial heats in November. The ‘MAW Heating Solution’ is designed to mimic a solar air heater using materials that are often taken for granted such as soft drinks cans. The project was a result of environmental research carried out by the pupils, and they discovered individual households in the UK can require up to 30,000-kilowatt hours of energy each year. The heater is simple, cheap and made from accessible recyclable materials that are heated from the sun and surrounding air which could then be transferred to a house. Set on a 60 acre rural campus in the beautiful Kent countryside, Bethany School is a flourishing co-educational day and boarding school that provides a welcoming and caring environment for pupils between the ages of 11 and 18. London is less than an hour by train, Europe on our doorstep thanks to terminals at Ashford and Ebbsfleet, and the rest of the world is within easy reach as Gatwick Airport is just one hour by taxi and Heathrow is an hour and a half.